On Tuesday, June 30, there will be a conjunction of Jupiter and Venus. 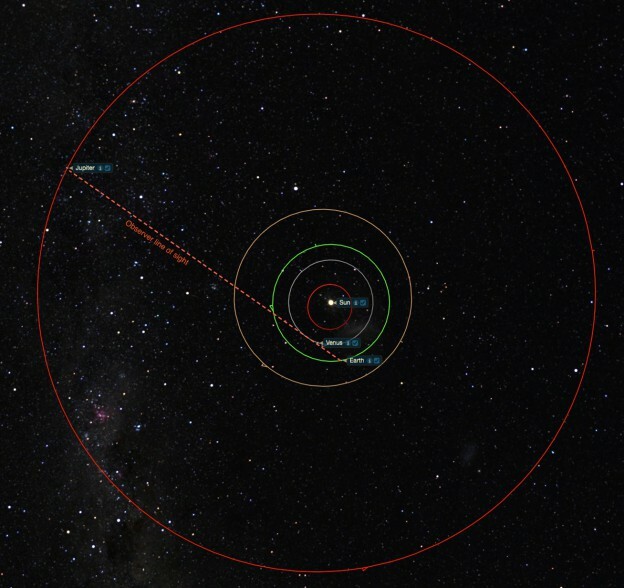 A conjunction is a celestial event in which two planets or a planet and the moon or a planet and a star appear close together in the night sky. Conjunctions have no real astronomical value, but they are nice to view. While conjunctions aren’t as rare as one might think, this conjunction of Jupiter and Venus will be more impressive than most. The casual backyard observer may have noticed that these two planets have been moving closer together for the past few weeks. On June 30, they will be so close that one will be able to hold a finger up and cover both Jupiter and Venus at the same time. In reality, the planets are hundreds of millions of miles apart. On June 30, Venus is about 46 million miles from Earth, and Jupiter is 560 million miles from Earth. Looking up at the sky, Venus appears to be much brighter than Jupiter. That is only because Venus is so much closer to Earth. Jupiter, the largest planet in our solar system, is actually over 11 times bigger than Venus, but it is dimmer when looking at the sky because of its great distance from our planet. Typically the best conditions for stargazing involve a dark sky, so getting away from urban areas will make stars and faint objects like nebulae and galaxies more visible. The Jupiter and Venus conjunction will be easily bright enough to see from any location, even large cities. The best hours for viewing will be during evening twilight and up until 10:30 PM local time, when the planets will set behind the western horizon. Thank you for such a useful and graphic with good common sense website dictating how to tell us earthlings these wonderful celestial events. I love your maps. Your work validates what our “work” can be inspired from! I’m wondering what he meant by “10:30 PM local time”. Where is that ‘local time’? Cloud coverage tonight! So disappointed I won’t be able to see it. Will you have a live feed showing it? Thanks! Hi ! I used the “hold a finger up and cover both Jupiter and Venus at the same time” trick, worked like a charm ! Felt like magic 😀 . Thanks for the great article ! How often does a Jupiter-Venus conjunction happen? When can we see the next one? I’m seeing a lot of conflicting dates online. I’ve read that this happened 2000 years ago, I wonder if it’s true. What about happening together with the Full moon right now in the opposite direction to the east? I saw this wonderful event !!!!!! !